Hydrolyzed soy protein is a type of edible soy manufactured through the chemical processing of natural soy. Manufacturers commonly refer to hydrolyzed soy protein as vegetable protein. However, this label is somewhat misleading since not all vegetable protein derives from soy. According to "Soy Protein Products: Characteristics, Nutritional Aspects, and Utilization," hydrolyzation of soy produces chemicals that can negatively affect your health. Hydrolysis is a method of extraction that boils the soy protein in a vat of sulfuric acid. Manufacturers mix the resulting acidic substance with caustic soda to neutralize the acid content. While hydrolyzed soy protein contains most of the nutrients and health benefits of soy, when you consume this type of soy you also consume the unhealthy chemical byproducts of the manufacturing process. 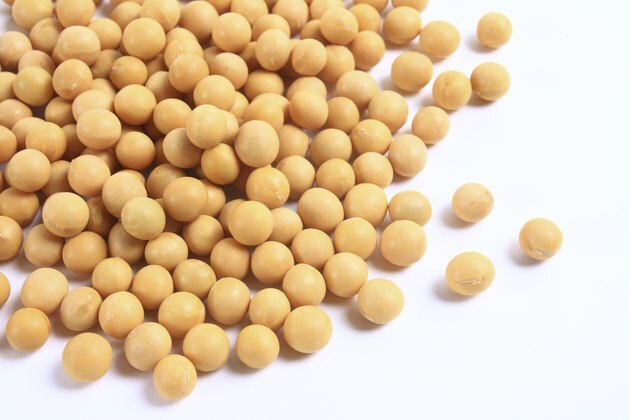 According to "Soy Protein and Formulated Meat Products," the potential harm of consuming hydrolyzed soy protein comes directly from the hydrolyzation process. The hydrolyzation process produces several harmful compounds such as monosodium glutamate that can lead to health problems. According to "Excitotoxins: The Taste That Kills," the Food and Drug Administration requires food manufacturers to list MSG as an ingredient when used in the preparation of packaged food. However, FDA regulations do not require the same labeling when a food contains hydrolyzed soy protein, despite the fact that this type of soy contains large quantities of MSG. In fact, some food manufacturers use hydrolyzed soy protein as a flavor enhancer to work around the FDA's MSG labeling requirement. This process of using an alternative ingredient such as hydrolyzed soy protein to avoid labeling requirements is commonly known in the food industry as clean labeling. Clean labeling allows food manufacturers to list ingredients on food labels that consumers will not recognize. According to "Excitotoxins: The Taste That Kills," clean labeling is a form of deception that relies on the naivete, misinformation or apathy of the general public. Additionally, clean labeling prevents you from knowing and understanding what you really put into your body. The deception goes a step further with hydrolyzed soy protein, as some manufacturers use this ingredient and state on the packaging that the product does not contain MSG. Hydrolyzed soy protein contains most of the benefits of non-processed soy. A 1 ounce serving of hydrolyzed soy protein contains approximately 94 calories, making this type of soy a relatively low-calorie protein option. Additionally, hydrolyzed soy protein contains approximately 9 grams of fat per 1 ounce serving, 9 grams of carbohydrate and 16 grams of protein. What Is MSG Made Of?